The Botanical name for a Maple tree is Acer. The botanical name for a Japanese Maple tree is Acer Palmatum. 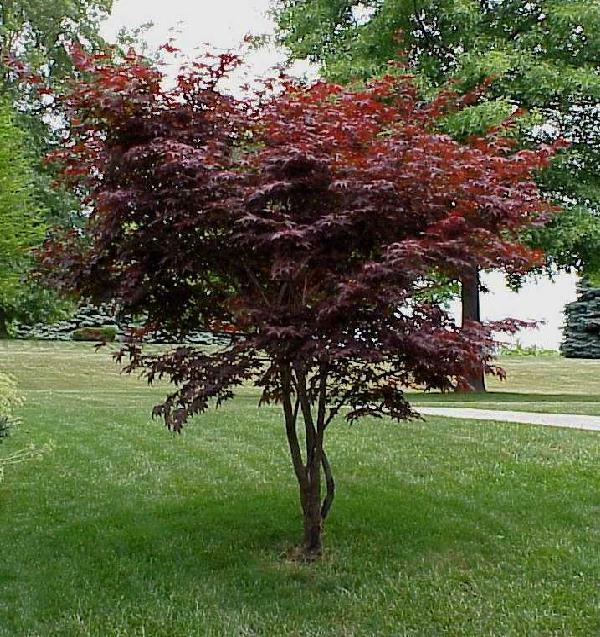 The botanical name for a Japanese Red Maple tree is Acer Palmatum atropurpureum out door plants. They grow to 20 feet-25 feet high with a 20 feet-25 feet spread. these do best in sun to sun/partial shade. These make great gifts. Gift Ideas: House Warming Gift! Wedding Present! (The Beauty of this tree will always remind them of that special day!) Anniversary gift! Great gift for first dates! The List goes On And On! As you can see, Japanese Red Maple's are beautiful! Picture is for example only. We are shipping seedlings currently 6-12 inches at the time of shipment. All products will arrive in a live (but possibly dormant) status to your door. Keep in mind each item is perishable and immediate care is needed to preserve the life of the plant. If you have any problems with your plant(s) within the 15 days of receipt, please contact us. Ask about our Spring special and how you can save even more money on all our plants. New lower prices and shipping. We have 2000 of these we need to sell before fall we are having huge savings on these and all our other items. Ask about our specials.